Using data collected by NASA’s late-great Cassini space probe, scientists have detected traces of complex organic molecules seeping out from Enceladus’ ice-covered ocean. It’s yet another sign that this intriguing Saturnian moon has what it takes to sustain life. If life exists elsewhere in our Solar System, chances are it’s on Enceladus. The moon features a vast, warm subterranean ocean, one sandwiched between an icy crust and a rocky core. Previous research shows this ocean contains simple organic molecules, minerals, and molecular hydrogen—an important source of chemical energy. On Earth, hydrothermal processes near volcanic vents are known to sustain complex ecosystems, raising hopes that something similar is happening on Enceladus. New research published today in Nature suggests Enceladus’ ocean also contains complex organic molecules—yet another sign that this moon contains the basic conditions and chemical ingredients to support life. Now, this isn’t proof that life exists on this icy moon, but it does show that Enceladus’ warm, soupy ocean is capable of producing complex and dynamic molecules, and the kinds of chemical reactions required to produce and sustain microbial life. Artist’s impression of Cassini diving through the Enceladus plume in 2015. This discovery was made possible thanks to a neat geophysical quirk that happens on Enceladus. Every once in a while, surface cracks appear, shooting plumes of vapor and ice grains into space. On October 28, 2015, the Cassini probe flew through these plumes, collecting samples. The probe’s Cosmic Dust Analyzer (CDA) and Ion and Neutral Mass Spectrometer (INMS) made measurements, both within the plume and inside Saturn’s E-ring, which is formed by plume ice grains escaping from the moon. Researchers from the Southwest Research Institute, the University of Heidelberg, and other institutions, took a look at this data with a mass spectrometer. The scientists detected signatures consistent with large, complex, carbon-rich organic molecules. These findings were verified by comparing the spectral lines to an analogous experiment conducted on Earth. The researchers theorise that chemical reactions created by warm water rubbing along the rocky core are producing the compounds. The newly confirmed organic molecules feature masses above 200 atomic units, which is more than 10 times heavier than methane. These molecules contain aromatic structures (ring-shaped, flat molecules) with possible cross chains of hydrocarbons. The source of these complex organics could be of a non-biological or biological nature, but the exact origin has not been determined. Khawaja says this complex organic material is originating within the subsurface ocean and that it’s floating as a thin layer atop the surface of the ocean. It also appears to be highly hydrophobic, meaning it’s repelled by water. 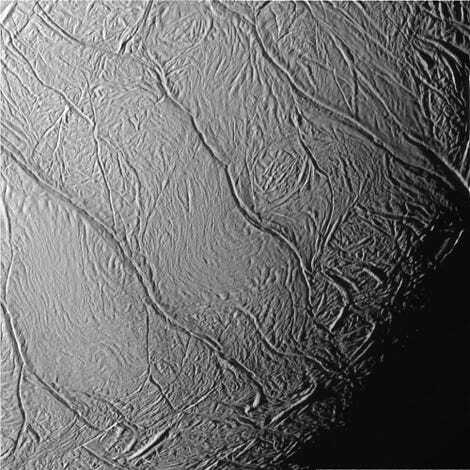 Detailed surface features of Enceladus’ frozen surface. Enceladus, this study shows, exhibits critical requirements for life, a finding affirmed by previous studies, and it’s now the only object besides Earth known to harbor these conditions. Jonathan I. Lunine, an astrophysicist and planetary scientist from Cornell University who wasn’t involved with the new study (though he was a referee during the journal’s peer review process for the paper), said the authors “made a compelling case” and “there is very little doubt” that the signatures analysed by the researchers were produced by organic molecules. Lunine says it’s an important discovery because it’s the first detection of carbon-and hydrogen-bearing molecules in the ice grains coming from Enceladus, as opposed to just the vapour. Christopher P. McKay, a planetary scientist at NASA Ames Research Center, also not involved with the study, said the discovery is interesting, but he says meteors or comets may have delivered the organic compounds detected in the plume. McKay says the new research suggests Enceladus’ ocean “is an organic-rich soup and clearly is habitable for life,” while cautioning that we still don’t know if life exists on Enceladus. “The presence of these organics directly do not make the case,” he said.